Highways England have a project to create “grade separated” junctions at the Kingsway, Markeaton and Little Eaton Islands on the A38. That means the local roads will be at ground level, but the A38 carriageway will be either above or below the local roads, on a bridge or in an underpass. DCG have been campaigning to make the scheme deliver good quality cycling and walking routes alongside and crossing the A38 as well as the “improvements” for motorised traffic. It is important that the A38 becomes less of a barrier for cycling and walking than it is today, and that this project enables more local journeys to be made without a car. The project is out for consultation now, please submit a response supporting the cycling schemes already being proposed but also asking for even more and better improvements than these. We recommend you fill in the form, AND send an e-mail if you have other points which you wish to make that are not covered by their questionnaire. In April 2018, DCG met with Highways England’s agents, AECom. We presented a list of requirements and after the meeting, marked up how well the project was planning the deliver them; see the results in the. DCG A38 Derby Junctions Checklist . The A38 junctions project always has had some intent of delivering better cycling and walking routes than exist today; they made some significant improvements by the time of our meeting in April and have made other improvements prior to this latest consultation. The project is not committed to segregated cycling and walking routes (ie where the cycling and walking paths are separated from each other). Some routes are not direct, others are not continuous and at least one is ridiculously narrow. There is great potential for better cycling routes leading to/from the new facilities proposed alongside/across the A38, but many have not been realised in the designs so far. There must be a plan to maximise the cycling and walking benefits from the A38 Junctions project by building these “nearby” feeder routes. The scheme must provide continuous, direct, segregated cycling and walking routes, separated from the main A38 carriageway and its slip roads. Where cycling and walking routes cross the A38 or its slip roads, signal controlled crossings must be provided. All cycling and walking routes must be off-road, must be safe enough and feel safe enough, for parents to allow their children to use them to get to school or to visit friends. Retain the “curly bridge” over Queensway into Markeaton Park – this is planned to be replaced, make sure they know it’s important. Build a good quality cycle path from Little Eaton to Pektron Islands alongside the A61 to replace the horrendously narrow path which is there now; buy land to enable a segregated path to be built. Build the section of the Derwent Valley Cycleway from Haslams Lane to the A38, alongside the River Derwent. Ensure existing cycle paths remain open AT ALL TIMES during the construction of the A38 junctions, including the provision of diversion which are ACCESSIBLE TO ALL riders and walkers. All construction traffic must be required to have all the current cyclist detection technology fitted and operational, and work site entrances should employ Trixie mirrors to ensure drivers entering/leaving the site can see cyclists crossing on the cycle paths or on the road. Write to Michael Gove and Therese Coffey to urge that Friar Gate cycle lanes are retained. Open letter to Michael Gove – Save Friar Gate Cycle LaneS! 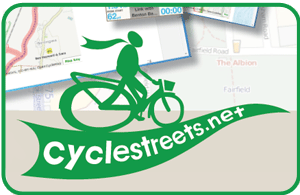 Plan your cycle journey in Derby with CycleStreets!